Minnie is a good sized black and orange, female tiger stripe, with white feet – about a year and a half old. Her coloring is absolutely gorgeous! Her beauty will capture your eye but her personality will win you over. She loves attention and prefers to be your one and only. 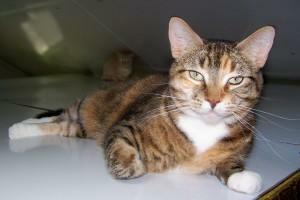 Please consider Minnie for your home. A calm girl to come home to. 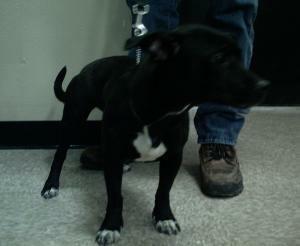 Remy is an adorable Schipperke mix that was left behind and needs a new home. Only 11 months old and weighing just 20 lbs. she longs to be in a loving home of her own. Remmy is mostly black with some white. She is good with kids and other dogs. Please consider her for your family. This entry was posted in Uncategorized and tagged cats for adoption, McHenry County Pets for adoption, Pet, pets in McHenry for adoption, puppy's for adoption, Schipperke. Bookmark the permalink.